The administration is engaging in a month-long “blitz” to promote a lame-duck vote in Congress for the Trans-Pacific Partnership (TPP). 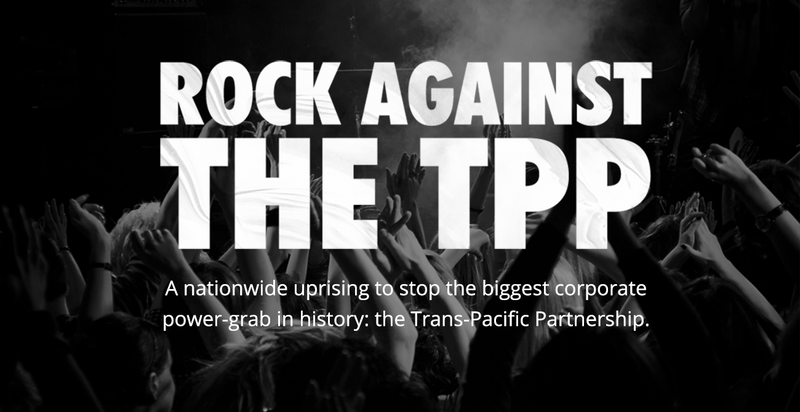 At the same time Rock Against The TPP has launched a concert tour to drive public awareness of the implications of TPP. Which do you think will be more fun? The White House is making an all-out push to win passage of the deal in the lame-duck session of Congress, organizing 30 events over the congressional recess to gin up support for the agreement, considered key to Obama’s strategy to counter China in the Asia-Pacific region. The strategy is to offer support and cover to the small flock of Democrats who supported legislation to fast-track the deal and to remind wavering Republicans that they oppose it at their own peril because of its strong business support. A “lame duck” session of Congress occurs following the election, but before newly elected members are sworn in. This means there is little accountability. Those tossed out or retiring are looking for lobbying jobs, those re-elected are looking to pay off their corporate campaign donors. Keep this in mind: If you close a factory in the US, lay off the workers, and instead import the same goods to sell in the same stores, you have just “increased trade” because now those goods cross a border. While neither side has intense feelings about past trade agreements, the majority of voters say they have generally been a good thing for the United States, with only 36 percent saying it is a bad thing. Importantly, neither side has strong opinions: just 15 percent say it is a “very” good or bad thing. [. . .] After hearing a balanced debate – including overall statements and specific arguments in support and in opposition to TPP – voters become dramatically less positive about the value of past trade agreements and much more pessimistic about TPP. Voters move from believing past trade deals are positive by 15 points to parity with those believing they are a bad thing, and voters shift from parity in the argument over TPP to two-thirds opposing it. Most importantly, 61 percent of voters are now eager to hold a Member of Congress accountable should he or she vote to pass the TPP when it is taken up. Before hearing the arguments in favor and against, a majority favors. After hearing both sides, 2/3 oppose and say they will hold members of Congress accountable. A series of concerts featuring feature Tom Morello (from Prophets of Rage, Rage Against the Machine, Audioslave), popular punk band Anti-Flag, Golden Globe nominated actress Evangeline Lilly (from Lost, The Hobbit, Ant-Man), Denver-based hip-hop outfit Flobots, buzzworthy bi-lingual rockers Downtown Boys and others is touring the country to drive awareness of the perils of TPP. A controversial, 12-nation trade agreement is making unusual bedfellows, both in Washington, D.C. and among artists. This Friday, hip-hop musician Talib Kweli, actor Evangeline Lilly, punk-rock band Anti-Flag, comedian Hari Kondabolu and others will perform as part of “Rock Against the TPP” at Showbox SoDo to protest the proposed Trans-Pacific Partnership (TPP), a Pacific Rim trade agreement that has been in the works for years but hasn’t been ratified by all the countries involved — including the U.S.
Organizers say their goal is simply to put the TPP, and an impending congressional vote to implement it, on people’s radars. The upcoming concert schedule right now is: August 19 in Seattle, WA; August 20 in Portland, OR; and September 9 in San Francisco, CA. Click here for free tickets.